Governor Wike said that strategic credible intelligence available to him revealed that a Federal Minister told a gathering that following the successful move on the Supreme Court, the next target will be the Court of Appeal and Federal High Court. Speaking during the central healing service of the Greater Evangelism World Crusade on Sunday in Port Harcourt, Governor Wike said that the APC Federal Government has collected the asset declaration forms of 200 Judges from the Code of Conduct Bureau (CCB) for the planned onslaught. He said: “I intercepted a discussion by a Minister of the Federal Executive Council where he was telling a gathering that they are happy that they have dealt with the Supreme Court. The Minister said that the next set would be the Court of Appeal Judges and the Federal High Court judges. The Minister said any judge that fails to cooperate will be compelled to resign. “This APC Federal Government has gone to the Code of Conduct Bureau to get the asset declaration forms of 200 Judges. Any judge that fails to follow their evil plot, will be harassed and prosecuted”. The governor noted that the APC Federal Government will generate several allegations to compel some judges to resign from the bench. Governor Wike called on the Church to pray for the Federal Judiciary to survive the deadly siege. He said: “The Church should continually pray for the Federal Judiciary. The Judiciary in Nigeria is under siege. If anything happens to the judiciary, our democracy is in trouble . “The Church needs to pray for the judges to remain strong in the face of intimidation and harassment. 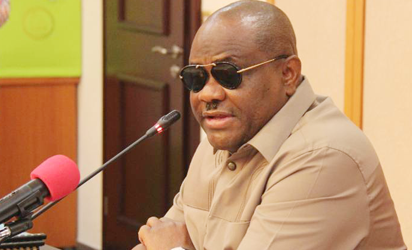 ” On the forthcoming general elections, Governor Wike urged the people to vote for the revival of the country. He said the country is not doing well and needs to make progress. He thanked the Church for praying for peaceful and credible polls in Rivers State. International Director of Greater Evangelism World Crusade, Pastor Isaac Olori said the forthcoming general elections are crucial to the country moving away from the era of under-development and siege. He said that the Church shares in Governor Wike’s passion for prayers as a platform for making a difference in a Christian society. Pastor Olori said every leader must have a listening ear and the ability to respond to the needs of the people by addressing their challenges. He said: “We are not looking for helpless people to lead us . We want leaders with capacity. That is why the forthcoming elections are very important. “If anyone is looking for leadership, be prepared to make a difference in the society”. Pastor Mrs Nonye Numbere led prayers for peaceful, free and fair elections in Rivers State and Nigeria. The Church led by the International Director, Pastor Isaac Olori prayed for Governor Wike, his family and the Rivers State Government.